The holy one, the true, who holds the key of David, who opens and no one shall close, who closes and no one shall open, says this: "I know your works (behold, I have left an open door before you, which no one can close). You have limited strength, and yet you have kept my word and have not denied my name. Behold, I will make those of the assembly of Satan who claim to be Jews and are not, but are lying, behold I will make them come and fall prostrate at your feet, and they will realize that I love you. The victor I will make into a pillar in the temple of my God, and he will never leave it again. On him I will inscribe the name of my God and the name of the city of my God, the new Jerusalem, which comes down out of heaven from my God, as well as my new name." The church in Philadelphia (3:7-13) stood at an important junction of the imperial post road that ran from Rome through Troas, Pergamum, and Sardis on through to Tarsus and the East. They had an open door through which to share the gospel. Yet here too a synagogue of Satan opposed the believers. Although no archaeological evidence for a synagogue has been found, a 3rd-century A.D. inscription was found 10 miles east of the city mentioning a "synagogue of the Hebrews". Philadelphia was located in an earthquake-prone region called the Catacecaumene. 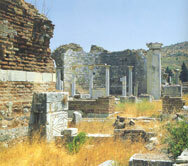 Both Sardis and Philadelphia were devastated by earthquakes in A.D. 17. Asian temples were built to withstand severe earthquakes. Their foundations were laid on beds of charcoal covered with wool fleeces, which caused the structure to "float" on the soil like a raft. Each block was joined to another by metal cramps, so that the platform was a unity. The temple would be the most secure structure in the city, hence the promise to be a pillar in the temple of God was one of security and safety. Inscribed pillars are found throughout Aegean Turkey. A dramatic example is the temple of Zeus at Euromos with dedicatory inscriptions on ten of the eleven standing pillars. Jesus will write divine names as well as his new name on those human "pillars" who overcome. Philadelphia received a new name twice in the first century: the first time after the A.D. 17 earthquake to "Neocaesarea" in gratitude for Tiberius' generosity, the second time to "Flavia" after Vespasian gave financial assistance following a similar catastrophe.